The nursery is just about all completed. I need to put some pictures in frames, but I didn’t want to do the big reveal until I got some sweet baby pictures in them. But I will share with you some of the projects! We decided to try and find a long dresser to use as a changing table and when looking on Craigslist was a bust, I made plans to hit some yard sales. Marc had never, ever, even once, been to a yard sale! We use to go quite often when we were children, but I hadn’t gone in some time. Luckily for my husband, the first yard sale we hit was a success! We brought home a dresser AND a nightstand for $30! 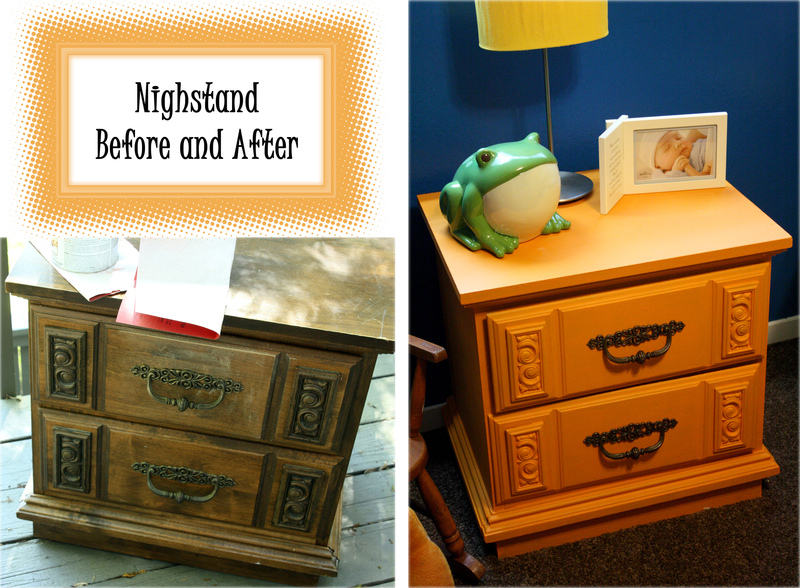 I sanded, primed, and used a sample size jar of paint to do the night stand. I am stashing all my breast-feeding supplies and burp cloths there since it is near the glider. Remember when I repainted the glider and said how great those sample sizes of paint were? Well, the size and cost is awesome, but the paint quality is not. I realized this after I painted the dresser. I bought a quart of satin paint for the dresser and the difference was HUGE. I didn’t even sand most of the dresser, just primed it, and it only needed one full coat of paint and some touch ups. All the other pieces of furniture I did with the sample paints had about 3 coats and still needed touch ups. I really wish I would have taken a real “before” picture of the dresser. The old drawers only give you a snapshot. 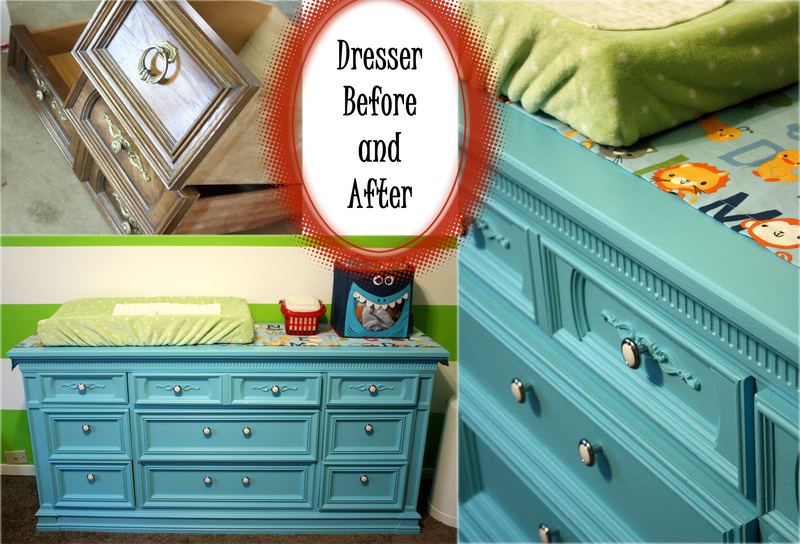 I LOVE how the dresser turned out! The blue was so lovely to work with and so pretty! I bought some regular knobs at Wal-mart and I just love how the dresser turned out. For less than $100 we have two pieces of furniture! You can’t even buy a dresser for that much, and sometimes you can’t even find a night stand for less than $100!